Robert E. Watson has always loved poetry. It wasn’t until he took a course at the University of Maryland entitled, “Modern Poetry” with Professor Rudd Fleming that he was told he should publish his poems, many of which were written during his association with the professor. Watson’s poems are accompanied by reproductions of some of his commercially available photographs as well as some personal photos that give the reader insight into the people, locations, and timeframes referenced in his poems. 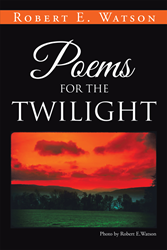 In “Poems for the Twilight,” readers can find wisdom in the rhythm and language of Watson’s poems as they follow him along life’s journey. Robert Watson was born in West Baltimore in 1940. He attended the University of Maryland, earning a BA degree in 1964. His love of poetry blossomed, and many of his early poems were written during this time. In 1965, he became Associate Editor and later editor and general manager of the Central Maryland News (later the Howard County News). He won nine awards for excellence in journalism from the Maryland-Delaware-DC Press Association’s Better Newspaper Contest, including five first place awards. He earned a Master of Arts degree from Johns Hopkins University in its exclusive Writing Seminars Masers Program in 1971. He entered the University of Maryland Law School in 1976, graduating with his Juris Doctorate degree in 1978, and moved to Garrett County, Maryland, where he opened a successful law practice and married his lovely wife, Rita.